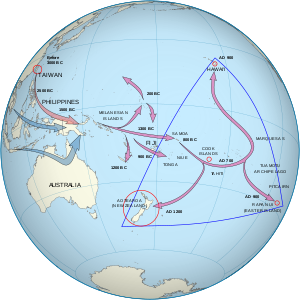 From Taiwan through Melanesia to Polynesia, and earlier migration to Australia and New Guinea. New Zealand was one of the last major lands to be settled by humans. Maternal mitochondrial DNA analysis suggests that Polynesians, including Samoans, Tongans, Niueans, Cook Islanders, Tahitians, Hawaiians, Marquesans and Māori, are genetically linked to indigenous peoples of parts of Maritime Southeast Asia including those of Taiwanese aborigines. This DNA evidence is supported by linguistic and archaeological evidence. Recent studies into paternal Y chromosome analysis shows that Polynesians are also genetically linked to peoples of Melanesia. Between about 2000 and 1000 BC speakers of Austronesian languages spread through Maritime South-East Asia – almost certainly starting out from Taiwan – into the edges of western Micronesia and on into Melanesia. In the archaeological record there are well-defined traces of this expansion which allow the path it took to be followed and dated with a degree of certainty. In the mid-2nd millennium BC a distinctive culture appeared suddenly in north-west Melanesia, in the Bismarck Archipelago, the chain of islands forming a great arc from New Britain to the Admiralty Islands. This culture, known as Lapita, stands out in the Melanesian archeological record, with its large permanent villages on beach terraces along the coasts. Particularly characteristic of the Lapita culture is the making of pottery, including a great many vessels of varied shapes, some distinguished by fine patterns and motifs pressed into the clay. Within a mere three or four centuries between about 1300 and 900 BC, the Lapita culture spread 6000 km further to the east from the Bismarck Archipelago, until it reached as far as Samoa and Tonga. In this region, the distinctive Polynesian culture developed. The cultivation before western exploration by many Polynesian cultures of the sweet potato, a South American plant, is also evidence for contact. Sweet potato has been radiocarbon-dated in the Cook Islands to 1000 AD, and current thinking is that it was brought to central Polynesia around 700 AD, possibly by Polynesians who had traveled to South America and back, and spread across Polynesia to Hawaii and New Zealand from there. 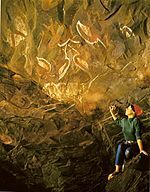 Birdmen (Tangata manu) paintings in a cave at the foot of Rano Kau, Rapa Nui (Easter Island). "Bird King" (Sarimanok) wood carving from Maranao, Mindanao. 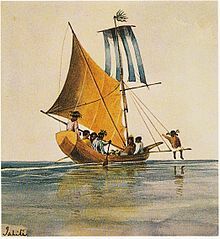 While the early Polynesians were skilled navigators, most evidence indicates that their primary exploratory motivation was to ease the demands of burgeoning populations. Polynesian mythology does not speak of explorers bent on conquest of new territories, but rather of heroic discoverers of new lands for the benefit of those who voyaged with them. While further influxes of immigrants from other Polynesian islands sometimes augmented the growth and development of the local population, for the most part, each island or island group's culture developed in isolation. There was no widespread inter-island group communication, nor is there much indication during this period of any interest in such communications, at least not for economic reasons. However, almost all these isolated colonies originating from Maritime Southeast Asia still retained the strong influence of their ancestral culture. These are very obvious in social hierarchies, language, and technology which point to a common source with the Dayaks, Tao, Ifugao, and Bajau. During the period following complete settlement of Polynesia, each local population developed politically in diverse ways, from fully developed kingdoms in some islands and island groups, to constantly warring tribes or extended family groups between various sections of islands, or in some cases, even within the same valleys on various islands. While it is likely that population pressures caused tensions between various groups, the primary force that seems to have driven unity or division among tribes and family groups is geophysical: on low islands, where communications are essentially unimpeded, there does not appear to have developed any widely observable incidence of conflict. Meanwhile, on most high islands, there were, historically, warring groups inhabiting various districts, usually delimited primarily by mountain ridges, with carefully drawn lowland boundaries. Early on, however, many such islands developed a united social and political structure, usually under the leadership of a strong monarch. An example is the Marquesas Islands, which, unlike other high-island groups in Polynesia, are not surrounded by fringing coral reefs, and consequently have no low coastal plains. Every valley in the Marquesas is accessible to other valleys only via boat, or by traveling over steep mountain ridges. The Polynesian Hula dance originates in Austronesian culture and are culturally similar to the types of dance that are known throughout similar linguistic cultures such as Bali. Other dances of Polynesia are: Fakanau, Fakaseasea, Haka, Maulu'ulu, Taualuga, Titi torea, and Ura. The first Polynesian islands visited by European explorers were the Marquesas Islands, first discovered by Europeans when the Spanish navigator, Álvaro de Mendaña de Neira, found the islands in 1595. Because of the paucity of mineral or gemological resources, the exploration of Polynesia by European navigators (whose primary interest was economic), was of little more than passing interest. The great navigator Captain James Cook was the first to attempt to explore as much of Polynesia as possible. Following the initial European contacts with Polynesia, a great number of changes occurred within Polynesian culture, mostly as a result of colonization by European powers, the introduction of a large number of alien diseases to which the Polynesians had no immunity, slaving ventures to supply plantations in South America, and an influx of Christian missionaries, many of whom regarded the Polynesians as descendants of the lost tribes of Israel. In many cases, colonizing powers, usually under pressure from missionary elements, forcibly suppressed native cultural expression, including the use of the native Polynesian languages. All of the Polynesian outliers were subsumed into the sometimes-overlapping territorial claims of Japan, the United Kingdom and France. During World War II, a number of Polynesian islands played critical roles. The critical attack that brought the United States into the war was the Japanese attack on Pearl Harbor, in south-central Oahu, Hawaii. A number of islands were developed by the Allies as military bases, especially by the American forces, including as far east as Bora Bora. Following World War II, political change came more slowly to the islands of Polynesia than to the other parts of overseas colonies of European powers. Although sovereignty was granted by royal proclamation to New Zealand as early as 1907, this did not go into full effect until 1947. Tonga was never actually a colony, but a limited protectorate of the United Kingdom. Tonga never relinquished internal self-government, but when external foreign affairs were again decided by Tongans without reference to the United Kingdom in 1970, Tonga was said to have rejoined the Comity of Nations. Tonga is the only island group in the South Pacific that was never colonised by a European power. The various outliers lie in the sovereign territory of the nations of Vanuatu, the Solomon Islands, Fiji, the Federated States of Micronesia, and the French territory of New Caledonia. Hawaii became a state of the United States, giving it equal political status to the other 49 states. Independence and increasing autonomy is not the only influence affecting modern Polynesian society. The primary driving forces are, in fact, the ever-increasing accessibility of the islands to outside influences, through improved air communications as well as through vastly improved telecommunications capabilities. The economic importance of tourism has also had a tremendous impact on the direction of the development of the various island societies. Accessibility of outside sources, as well as the tourism viability of individual islands, has played an important role to which the modern culture has adapted itself to accommodate the interests of outsiders, as opposed to the influences of those intent upon promoting the retention of native traditions. Because of this, Polynesia is today an area in varying degrees of extreme cultural flux. W. Arthur Whistler. Plants of the Canoe People: An Ethnobotanical Voyage through Polynesia. Honolulu: University of Hawaii Press, 2009. ISBN 978-0-915809-00-4. ^ For a discussion of the origins of Eastern Polynesians, particularly the Māori of New Zealand, see: Douglas G. Sutton, ed., The Origins of the First New Zealanders (Auckland, New Zealand: Auckland, 1994). ^ M. Kayser, S. Brauer, G. Weiss, P.A. Underhill, L. Roewer, W. Schiefenhövel, and M. Stoneking, "Melanesian origin of Polynesian Y chromosomes," Current Biology, vol. 10, no. 20, pages 1237–1246 (19 Oct. 2000). See also correction in: Current Biology, vol. 11, no. 2, pages 141–142 (23 Jan. 2001). ^ 20069298" Howe, K. R (2006). Vaka Moana: Voyages of the Ancestors - the discovery and settlement of the Pacific. Albany, Auckland: David Bateman. pp. 92–98. ^ "Home". The Official Website Of Niue Tourism. Retrieved 6 April 2018. ^ "Niue". New Zealand Post Stamps. Retrieved 6 April 2018. This page was last edited on 9 April 2019, at 09:55 (UTC).